The Garuda seva on the day following Thai Amavasya from all the 11 temples is very famous. Access to the temple Standing Posture and East-faced. 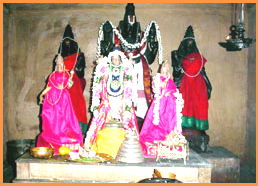 The Moolavar of this Divyadesam is Varadharaja Perumal. Also known as Manikooda Nayagan. He is giving his seva in Nindra (Standing) Thirukkolam in facing his thirumugham towards east direction. He is found with Four hands on the Aadhiseshan. Prathyaksham for Lord Chandran. This temple lies near Thirunaangur of Tanjore district in Tamil Nadu. It's about 8 Km away from Seerkazhi and 1/2 kms away from Thirunaangur.